Stork's Nest is a prenatal education program operated by Zeta Phi Beta Sorority, Inc., the March of Dimes and cooperating community agencies. The program provides incentives and encouragement for women to keep prenatal care appointments, a critical factor for helping babies get a healthy start in life. The collaboration between the March of Dimes and Zeta Phi Beta Sorority, Inc. Stork's Nest was established as a national service program in 1971. 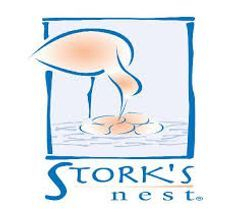 The first Stork’s Nest was established in Atlanta by the Fulton-DeKalb-Clayton Chapter of the National Foundation of the March of Dimes. It was one of many educational and service projects of Better Infant Birth (BIB), a highly successful program that actually enlisted the services of 12 member organizations including Zeta Phi Beta Sorority, Inc.
Stork's Nest has since become a national project of Zeta Phi Beta Sorority, Inc. Today, there are more than 100 nests across the country. There are more than 150 nests nationwide that serve 25,000 women each year.